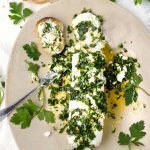 Tangy, creamy goat cheese absorbs the flavors of this fresh garlicky dressing and is transformed into the most delicious appetizer. Serve with baguette slices or crackers. Put the goat cheese log on a serving plate. Score it lengthwise and then a few times crosswise, to open it up a bit. Whisk the dressing ingredients and pour over the goat cheese. Best to prepare this a half hour before serving so it softens a bit and absorbs the flavors of the dressing. Serve with crackers or sliced baguette. Enjoy!